DVD and beyond - IFA REPORT: How far away is the Promised Land of glasses-free 3D? IFA REPORT: How far away is the Promised Land of glasses-free 3D? With the exception of LG, which gave pride of place to the new immersive standard, 3D did not dominate this year's IFA – Berlin's annual consumer electronics bazaar. Given that, last year, CE manufacturers were outmaneuvering each other to show off the nascent TV format and capture the heart and mind of consumers (IFA is open to the public), 3D's presence this year was subdued, but for JEAN-LUC RENAUD, key issues gained prominence. Here is his personal take on them. As consumers have yet to embrace the stereoscopic vision with the resolve hoped for by foretellers, the industry is coming to the realisation that 3D is but one component - albeit an important one - of an ecosystem inhabited by HDTVs, connected devices, tablets and smartphones, rather than the jewel in the CE crown. But, make no mistake: 3D is here to stay and will make it big, eventually. And don't get rid of your active shutter 3D glasses, yet! Autostereoscopic 3D - a road to nowhere? The ink on the standardisation of 3D stereoscopic television using 3D glasses is barely dry and the industry is forging ahead with glasses-free autostereoscopic TV in the belief that it is the sine qua non for consumers to make 3D a success. In an event unsurprisingly hyped, Toshiba demonstrated the world's first commercial autostereoscopic TV - the 55-inch 55ZL2 model - announced for a December release in Germany at a price rumoured to be around €7,000. I waited in line to be squeezed into one of the small demo cubicles furbished with three armchairs and the TV some 2.5 meters away. I was underwhelmed. A disappointment that plagued most of the other glasses-free 3D demos I saw at IFA. The explanation in a nutshell: The autostereoscopic system Toshiba (and others) are using is based on lenticular technology. It relies on lens that zooms in on different groups of pixels when looking from different angles of vision. Thus, each eye sees a different set of pixels. By rendering different images for several angles of vision, depth perception is achieved without the need for glasses. The Achilles heel is that the number of angles of vision (or viewpoints) reduces the resolution of the original 3D image. Indeed, the number of pixels is divided by the number of viewpoints, and that is the reason why the autostereoscopic 3D image resolution using lenticular technology is - and always will be - less than that of the native TV panel resolution. Because the system on show provided for nine angles of vision, I judged the quality of the resulting 3D glasses-free picture to fall below that of a standard definition image, even though Toshiba's 55ZL2 display uses native Quad Full High Definition (QFHD) '4K' (3,840 x 2,160 pixels) panel - four times the number of pixels of current HDTV displays - to mitigate the loss of resolution. The added problem is that no source material is shot in 4K, and upscaling goes only some way. Chinese giant Haier was showing a 4K 65-inch LED autostereoscopic TV with eight angles of vision. The resulting glasses-free image was still unsatisfactory. Manufacturers could up the ante by using 8K panels to ensure that the output autostereoscopic image would come close to full HD. Not only the price tag does not bear thinking about, but also a native 4K (QFHD) 2D picture is already unbelievably sharp, not to mention an 8K picture. A highlight of the exhibition floor was Sharp displaying the world?-s first 8K4K 85-inch, direct-view, 7,680 x 4,320, 33-million pixel LCD panel: simply stunning and obsessively immersive! Who need 3D with that? Another acid test of where the glasses-free 3D developments stand is how smooth is the The configuration of Toshiba' demo cubicles made it hard to check that, unless you stepped on your neighbours' toes, which I did! This is Achilles' other heel. The effect is inescapably disruptive, even though several autostereoscopic protagonists make use of the so-called 'soft edge' technology. Hungarian company iPont (I visited a few days later at IBC Amsterdam) is proposing an approach that makes this transition between angles of vision oblique, thus slightly less noticeable, but at the price of generating more artifacts on the picture itself so far as I noticed. Russia's Triaxes (also visited at IBC) has pushed autostereoscopic 3D technology furthest in terms of comfort of vision, owing to enhanced depth map processing. 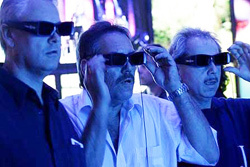 Triaxes is in partnership with Dimenco, a leading autostereoscopic 3D developer. At IFA's Future Zone, devoted to research in progress, Germany's Fraunhofer Institute shared its work on improving the software to process the virtual camera angle generation and, with it, the depth map. 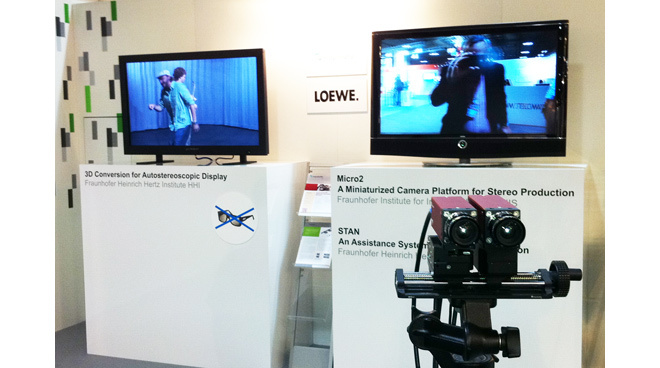 From a 2-camera live capture (pictured below), a heavy-duty computer was generating in real-time five intermediate virtual camera angles (theoretically up to 28 possible). Indeed, sorting out the depth perception issue exercises many researchers. The Promised Land of autostereoscopic 3D is still far away. An approach that goes a long way to resolving the unsatisfactory transition across viewpoints is one based on eye-tracking technology and the retrofitting of a solid sheet with a lense structure. It is a panel placed in front of a 2D TV or laptop screen that allows each eye to see a different set of pixels, so creating a sense of depth through parallax. An integrated eye-tracking system detects the user's position and transmits it to the 3D engine. This engine combines the images for the left and right eye to optimise the effect, in real time. As the 3D image is continuously adjusted according to the user's position, the user enjoys freedom of movement. 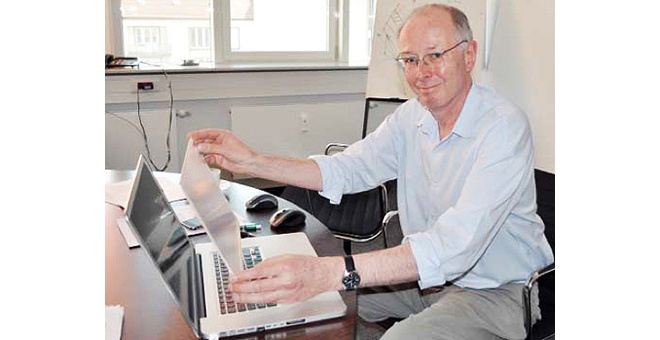 The 3D engine and associated 3mm-thick panel have been developed by German company SeeFront under the leadership of its CEO Christoph Grossmann (pictured below). Sony demonstrated this technology on its top-of-the-range Vaio S Notebooks. First, the user calibrates the system to fit his/her vision via a quick, easy-to-use procedure. The autostereoscopic 3D effect was remarkable. Indeed, the best 3D rendering without glasses I have seen to date. The panel will launch next month for this Vaio S Notebooks series, priced at €129. The relative small size of the computer screen - 15.5in - is undoubtedly helping to keep the picture sharp and bright. The eye-tracking technology caters only for one user, thus precluding its use for a living room TV. It is worth mentioning that Germany-s Fraunhofer Institute is working on eye-tracking technology that can accommodate several viewers simultaneously. I was impressed with the reactivity, speed and precision of the eye-tracking technology. 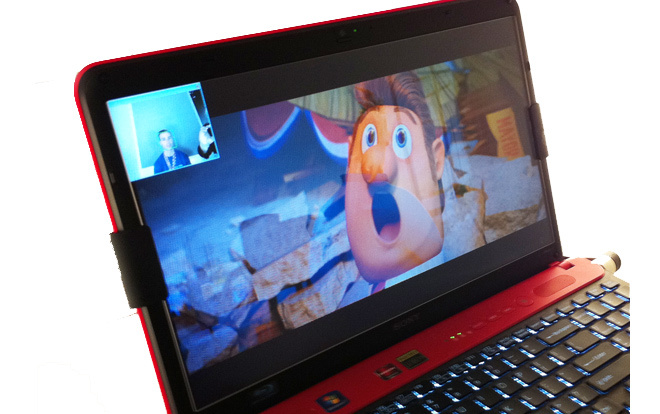 Toshiba, which was also showing glasses-free 3D on their high-end Qosmio laptop, told us that this 'home consumer'? eye-tracking application was originally developed as a security feature, similar to iris-recognition devices, for their professional computers. Most 3D demonstrations at IFA naturally involved use of glasses of both passive and active varieties. It was therefore a perfect battleground to assess the merits (or lack of it) of each system. For someone like me who consumes almost exclusively high-definition television output across all genres including news, not to mention Blu-ray disc content, I had somehow failed to appreciate how much a backward step passive 3D glasses (for home entertainment) represent. That both passive polarised and active shutter glasses technologies are given equal footing as a consumer proposition puzzles me, indeed concerns me greatly. In a nutshell, in a frame sequential method, left eye and right eye images are displayed alternately. Active shutter glasses are synchronised to show in each eye a Full HD 1080 image delivered from TV sets with fast refresh rates. With the polarising filter method, the left and right images are displayed on alternate horizontal lines of a 1920 x 1080 panel. Passive glasses thus deliver only a standard definition image. The resulting resolution can be even coarser when side-by-side half-screen images (e.g. Sky 3D) are converted to the alternate line format of passive screens. Here, the resolution drops to a quarter. The answer is a 4K panel, producing two 1080 images, although with side-by-side it means there are only 960 pixels to stretch and fill 2,160 across. When 3D picture quality is compared, active shutter glasses thrash their passive counterparts. There is no contest. Given their lower production cost and the propensity of visitors to keep souvenirs, it was passive glasses that were lent to visitors to taste 3D at the LG booth. The irony is that the quality of the finest 3D-capable HDTV sets on the market, that LG makes, will have been lost on visitors who will be treated to liny pictures from another age. Incidentally, LG was showing off what it claims is the world's largest 3D LED TV - the 72-inch LZ9900 model (pictured below). No release date or pricing were provided. This is no way of promoting the immersive 3D TV experience, especially when consumers are asked to spend their hard-earned cash on a 3D HDTV and a 3D Blu-ray player. They deserve to be told in no uncertain terms that it is active shutter 3D glasses that will maximize their assets. Passive glasses are being touted as the inexpensive and lighter option compared with active glasses. Toshiba was keen to promote its glasses-free 3D system claiming users don't want to wear 'bulky,' 'ugly,' 'heavy' 3D glasses. Perhaps, but considerable progress has been made on making all types of 3D glasses, in particular the active type, light and attractive. Samsung showed one (pictures below right). Designers are at it, and many consumers would be hard-pressed to pick the 3D version out of the eyewear range. A reminder of what 'true' 3D can offer was supplied by Panasonic which demonstrated its 3D LCD home cinema projector (PTAT5000E) showing clips of Avatar off a Blu-ray player, with active glasses. It sets the bar very high. It was also a welcome reminder that great 3D images are the product of great native 3D production. What I observed with grave concern is the flurry of activity on the 2D-to-3D real-time conversion front. Several big names were at it, demonstrating systems incorporated into either TV sets or Blu-ray players. This is just what the industry needs if it wants to nip 3D in the bud! A Samsung attendant was candid enough to volunteer that these conversion kits only produce a “bit more depth” to an existing image, not real 3D. CMOS Mediatech, a South Korean company, demonstrated 3D Spectat, a small box (125x92x28mm) selling for $55 on ebay, that converts 'on the fly' 2D material whatever the source into 3D. I saw the disappointing result on a BBC World feed. On a 3D-capable TV screen, the box will turn 2D material into 3D (working with passive or active glasses). With a standard (2D) TV screen, the kit will turn a 2D picture into an anaglyph (red-blue) 3D picture! 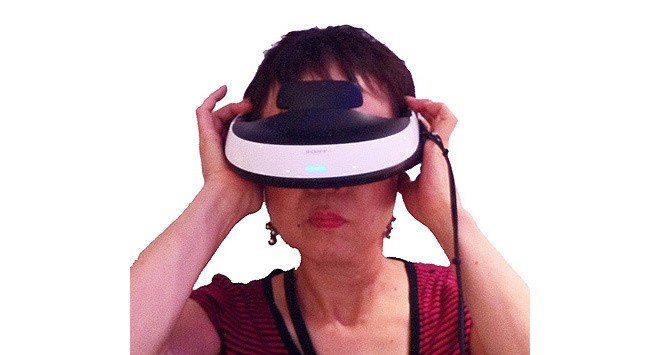 Sony showed its 3D visor - the HMZ-T1 (pictured below). Reminiscent of virtual reality helmets, the company claims it is the world's first 3D compatible head mounted display. The device uses two 0.7in OLED HD displays, complete with surround sound. It can connect to a Blu-ray player or a PlayStation 3 console. On sale in Japan in November for ?60,000 (€570), Sony plans to roll out the device in the US and Europe in time for Christmas. Warning: this 3D visor is a no-go for people with prescription glasses! Glasses are not for 3D use only. LG was demonstrating Dual Play, a new function on its Cinema 3D TV line. It allows two players wearing differently polarised glasses to engage in multiplayer games in full screen where previously players had to play on split screens (pictured below). Players 1 and 2 can see their own viewpoint on a full screen compared to the conventional approach of splitting one screen into two (side by side, top & bottom). Worth noting is Sony's digital binoculars with a built-in 3D HD recorder (pictured below). If you think that, with its 21x9 3DTV set, Philips launched the widest screen on the market, think again. 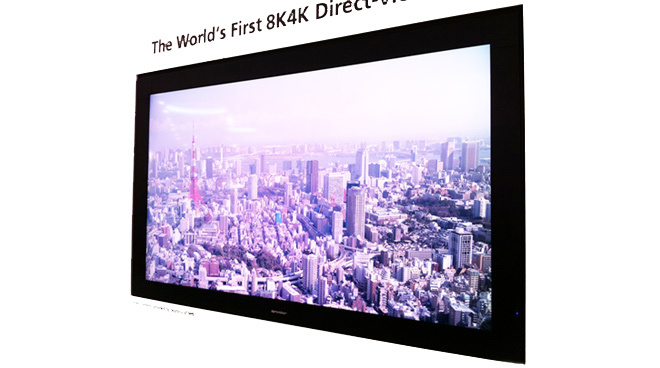 Chinese company Hisense demonstrated its 21x7 3DTV (pictured below). It translates into a 27x9 screen! As to what image source might fill the screen, I can only think (with the help of Wikipedia) of the 1959 version of Ben-Hur and a few sequences of How The West was Won, shot in the Ultra Panavision format (2.93:1). But Blu-ray Discs specs do not accommodate it. Apparently, the most they could squeeze is a native 2.35:1 transfer. Moving into unchartered territory, Haier showed the first completely wireless 3D TV, the result of a collaboration with the MIT. With its radiation free magnetic resonance coupling, the 55-inch TV can exchange energy remotely, thus functioning with no mains cable. The exchange of data also takes place wirelessly thanks to WHDI (Wireless Home Digital Interface) video technology, which enables a 1080p HD image to be transmitted over a distance of 30m at a speed of 3Gbps. The television also connects wirelessly to the Internet via a Wi-Fi dongle, enabling access to multiple applications and content. Pushing the envelope even further, Haier demonstrated a TV set that obeys signals from the user's brain. Thanks to a 'sensory' headset called Wave Brain (pictured below), each electrical impulse from the brain is analysed and compared, enabling mental power to change channels! Visitors were invited to try this channel-controlling system by testing out sensory relaxation games available on the stand. I declined, afraid to move effortlessly into a post-watershed territory! As they venture into the world of 3D, consumers are at the receiving end - even at the mercy - of powerful voices telling them to hold their purchasing decision until glasses-free 3D is on the retailers' shelves. "The requirement for 3D glasses is a temporary and unfortunate phase in the evolution of the immersive standard, which will eventually disappear as glasses-free alternatives are around the corner,"? so goes the argument. I say: don't believe a word of it! As true as the fluctuating price of apples will never alter Newton's Law of Universal Gravitation, frame sequential-based 3D technology using active shutter glasses will always be superior to passive polarised options, and especially to glasses-free technologies - and by a long shot - when it comes to providing the highest image quality, thus the best immersive experience. The current price of active 3D glasses, often used against them, will be a non-issue next year. Glasses-free 3D, so far as the goal is to match the quality achieved by active shutter glasses, is a mirage. The waterhole is always visible on the horizon, but never reached! It is therefore misleading, even counter-productive from a home entertainment industry standpoint, to encourage consumers to wait for the Promised Land when they can already enjoy earthly delights now. Many issues in this report have been examined by speakers at the Blu-ray Disc Academy 3D conference we organized in May in Hamburg. The video proceedings are available here.